This card is incredibly exciting. It's the first program to allow you to draw cards, and best of all, it does it without costing any clicks! It slots perfectly into a Freelance Coding Contract deck, allowing that deck to advance its strategies of churning through the deck. It slots perfectly onto Leprechaun, which a FCC deck wants, and costs exactly a Sahasrara's wort of credits. It grows your hand as you run. 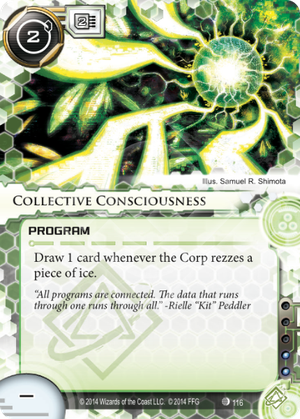 Sure, I know I'll have some hilarious (or "hilarious") points where the Corp rezzes an ICE, and I accidentally draw the vital program I was about to SMC out, and I'll laugh and I'll cry and I'll curse my deck and that'll be sad. But also hilarious, and a brilliant bit of Netrunning. Imagine running on Jinteki, and drawing ... your only Deus X. What joy! So, yes, this card has some downsides. And it's 2 MU. But it's sort of the opposite of Paintbrush, a card which makes all of your runs take more clicks. It compresses your clicks. And lets you see more cards. And seeing more cards is great. I'm ... honestly not sure how Anarch's doing for card-draw, or where Anarch will be in a month's time (writing circa All That Remains), but it's something I can see doing work for Criminals. Not, you know, good, top-level criminals, necessarily, but the sort of criminal with a Box-E and lots of tricks. It's a program that gives you cards. How cool is that? Let's be honest here, this is a one-of. Against a corp that has generally less but bigger ICE it's a mediocre draw engine. Against a corp with lots of smaller ICE, it's a pretty good draw engine. But at and 2 influence there's no way you'd splash this over in faction card draw, and frankly the requirement is tricky even for Shaper. There is one large caveat however. This ruins Thousand Cuts Jinteki. When half the cuts are healed before the wound even happens you're sitting pretty. So if that's giving you trouble and you need card draw and you're Shaper and you have the , (or at least most of those) it's worthy of some serious consideration. That said it also works quite nicely with Faust, and given you're probably not running many other breakers alongside the dark lord the becomes less of an issue. Rather than review just this card, I'll compare it to other cards. First off, it's pretty similar to Compromised Employee; it just gets you cards instead of credits. I'll admit, it's hard to compare cards to credits. However, Collective Consciousness costs TWO memory more and doesn't have the recurring credit for traces. For this reason, I'd consider Compromised Employee far superior. "But Compromised Employee is out of faction!" you might say. Sure, it might be one influence, but if you're still convinced you can't spare the influence, I'll compare it to other cards in faction. Firstly, I'll compare it to Magnum Opus. For only three more credits, you get something that singlehandedly drives an economic engine. Compared to a thing that'll give you a bit of card draw? Magnum Opus is far superior. Secondly, I'll compare it to Paintbrush. For only one more credit, you get something that'll let you run servers with relative ease with only one breaker. Admittedly, Paintbrush is situational, but I'd still consider it better than Collective Consciousness. Lastly, while it's out of faction, I'll compare it to Keyhole. For two more credits (and three influence), when running R&D, you get to avoid all traps, access triple the cards, and shuffle so you can run more this turn. That can singlehandedly win you the game. Sure, it costs three influence, but it's so much better than Collective Consciousness it's worth noting. For all these reasons, I think Collective Consciousness is extremely mediocre, especially because it costs a whopping two memory. I can't think of a deck in which this would be better pick than any cards I compared it to. So let's see... this card takes up 2 memory and it offers only situational card draw during a run (rather than at a more useful time like, say, before you have to run), but it's cheap and relatively low-influence. Sounds like it needs to be used in a deck that doesn't run a lot of programs (so you have memory to spare) and has some way to utilize cards during a run. Faust, anyone? Particularly once the new consumer-grade hardware comes out for Shaper, I think the combination could be quite effective: Faust as your main breaker, with all the usual Shaper tricks to get it out early and keep it on the table, combined with the economic power of Magnum Opus or Professional Contacts, a few supplemental breakers, and 1-3 copies of this to fuel it all. You've got all the in-faction R&D pressure and a breaker that can guarantee you get into the server.